Samsung Galaxy i5700 Lite renamed Spica? 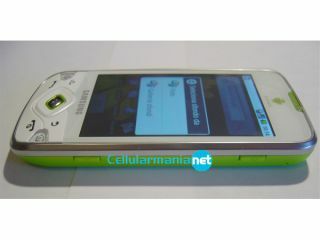 The Samsung Galaxy Lite i5700 Android handset is looking ever closer to a release at the moment, with an Italian site stating it will be renamed the Spica. Named after one of the brightest stars in the night sky, (we so knew that before we 'confirmed' it with Wikipedia) it would make sense that this would follow the 'Galaxy' tag attached to the first Android phone from Samsung. CellularMania.net has a pretty good hands on with the phone and a good list of specs - including a 3-inch OLED screen and a massive 1500mAh battery. The phone in question seems to be a hybrid of the production and prototype models we've seen - the lurid green back cover is likely to be gone for the launch, although it may be offered as an alternative colour for mobile phone sadists. The phone's 'Lite' tag comes from some slightly down-sized specs - the phone now has a 3.2MP camera without a flash, the phone's a little smaller and it won't be landing in the UK until early next year at least. But the i5700 Galaxy Lite does have a microSD slot, GPS, a compass and an FM radio (all the things you'd expect on such an Android phone) and will be a darn sight cheaper than it's bigger brother, which comes in over £500. Check out the translated Italian site if you want to see more, while we go off hunting to see if we can find a UK version of this phone.